Normally I only candle eggs once a week, every Saturday or Sunday, so this is kind of new to me also to be looking at one every day. So if you're thinking "gosh, it was more obvious a few days ago" I'd have to agree in some ways. The blood vessels are now little threads all over around the air cell instead of just in one concentrated area, but as you can see they don't photograph particularly well. What I am trying to show in this photo is that egg takes on a two-tone appearance, with the pointy end getting noticeably darker. It's been years since I took an embryology class so I can't explain WHY things look the way they do, and I'm not going to break these eggs open to get a better look. If you search the web for pics you can certainly find a lot, if that interests you. When I go through all the eggs this weekend I will photograph an infertile egg and a dead egg (there are sure to be both) so you can see the difference. 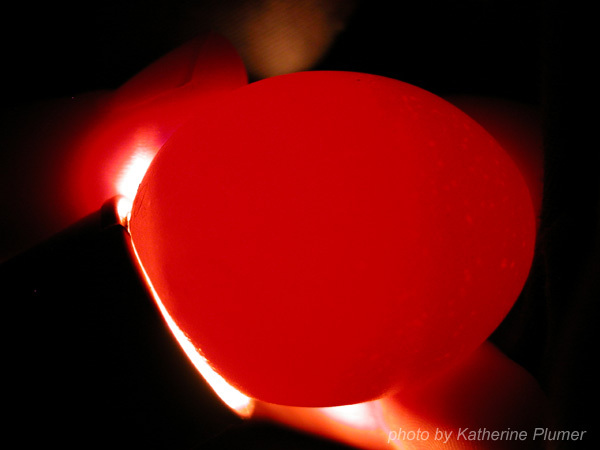 Why is the egg reddish-orange? They just look that way when you shine a light through them! The infertiles are often more of a yellowish orange. Don't ask me why. :-) "That's just how it is."